Over the winter I made a couple of visits to the section of Madeira Beach across from John's Pass Village. I noted that it may make a good location for a future family beach portrait session because of its long stretch of empty beach, seawall and most of all the newly completed drawbridge. Well, now that temps are in the high 70s the beach was no longer deserted and the seawall was covered with anglers. However, it remained a good location as the drawbridge was mostly free of people. Carie recently took a DSLR Photography Lesson and said how she was also interested in family portraits. I am always very pleased to be able to provide multiple services to the same client. 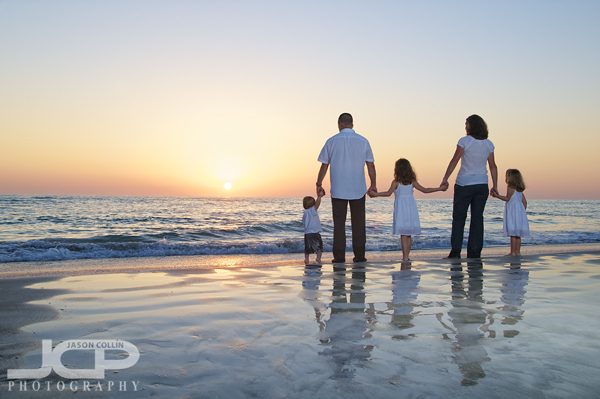 I met Carie and her family (three kids, one husband) on a warm Saturday evening at the aforementioned Madeira Beach spot. Carie herself ended up suggesting what turned out to be my favorite shot of the evening (see above). This is the second family portrait session in a row where this has happened (see first here). I was very conscious of reflections during this candid family portrait session.In a candid family beach portrait session I take a few photos of the whole family together, stationary first, then set everyone loose to do what they like on the beach. Carie's daughters took up a fascination with sailing a leaf down a tidal pool. Decades ago I first learned how to skimboard in such a section of water. Nikon D300 Nikkor AF ED 80-200mm f/2.8D @ f/4 ISO 200 1/1600th natural light - Madeira BeachCarie's family were great shoreline walkers maintaining a nice even plane (important for keeping everyone in focus) and perfect spacing between each other. I told them to walk at a good pace too, as it would make for a more natural positioning and final image. If one walks slowly, motion gets more deliberate and less pleasing to freeze in a frame. I wanted a turn myself! -- natural light Madeira Beach 15 minutes before sunsetThere has to be no greater joy for a child than to be tossed up into the air by their father! Florida's pale blue evening sky always provides a pleasing background for a photo of any subject matter. Nikon D300 Tamron 17-50mm f/2.8 @ f/5.6 ISO 200 1/125th Strobist: SB-800 @ 1/4th power on light stand to frame rightI always like to get one photo of just the parents, which was a quick operation this time as Carie's son is very active and would not stay long in the care of his two big sisters. The Gulf of Mexico was its typically calm self that evening. Up on the drawbridge over John's Pass!Above is the very last shot of the portrait session. I saved the drawbridge for last, after sunset, thinking the sky will then produce some great color and Mother Nature cooperated with a range of purples to oranges. I had a very good time photographing Carie and her family and trying out a new beach location. Thanks Carie!